Hike Pvt Ltd, the company that operates Hike messenger has reported a revenue of INR 11.4 crore in its latest financial statements for FY 16-17. Hike is India’s home-grown messaging app. Financial Performance of Hike Pvt. Ltd. The company’s latest balance sheet reports a drop in revenue of 67% from INR 34.93 crore in FY 2016 to INR 11.41 crore in FY 2017. However, the profit and loss statement reports similar amount of losses for both years. In both FY17 and FY 16, Hike reported losses of ~INR 215 crore. 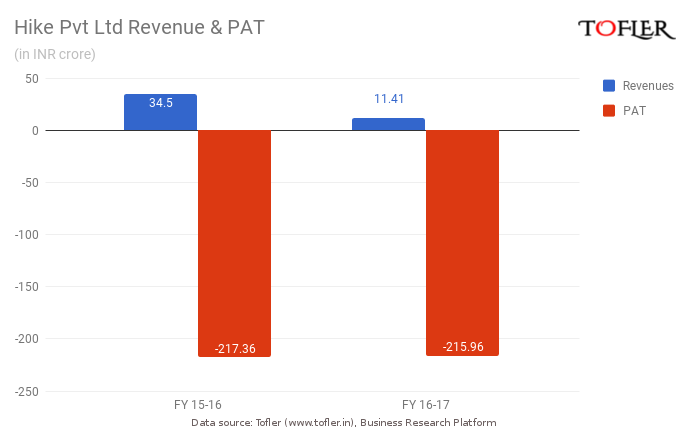 The bulk of Hike’s revenues are earned from its messaging app Hike Messenger. 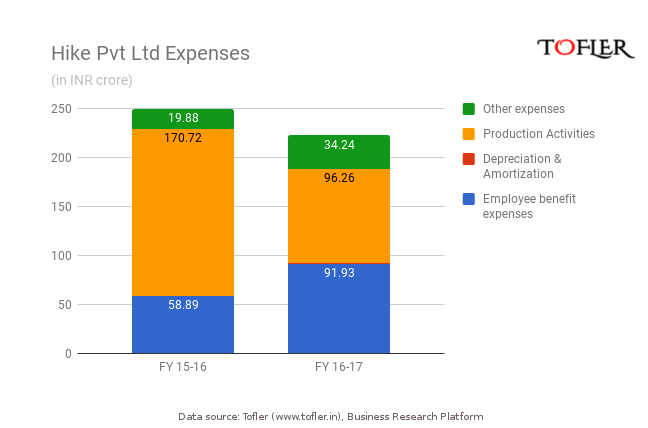 The company also reported total expenses of INR 227 crore in FY 16-17, which was not significantly higher than the previous year’s expenses of INR 252 crore. However, employee expenses of the company have gone up by 56%. At the same time, expenditure on production activities have gone down by 43.6% and other expenses have nearly doubled. Hike Pvt. Ltd., founded in 2011 in New Delhi under the holding company Hike Global Pte. Ltd., is the creator of the Hike Messenger app for smartphones in India. Hike Messenger Ltd. is a fellow subsidiary. The business is a joint venture between Bharti Enterprises and Japanese multinational telecom SoftBank. Hike has attracted investments from companies like Tencent and Foxconn to become one of India’s unicorns in 2016. Features of the messenger app that makes it attractive as an investment include regional language stickers and ready-to-share festival greetings, that give it an advantage in a large market of emerging Internet users, against competition like the Facebook-owned Whatsapp. One of the company’s latest innovations is the introduction of Hike Wallet, which allows users of the messenger app to recharge their mobile phone accounts, transfer money and send cash vouchers through the UPI integration. The app has also introduced features like Blue Packets, which is a fun way to send digital envelopes of money. Business activities of the company include acquisitions in the area of AI, payments, machine learning and computer vision.